* I am aware of the requirement for DC blocking capacitors when connecting to a grounded source (such as a line-in or external amplifier). I have done testing with the -MICRO on an external base board which includes a 1.0uF blocking cap for this reason. 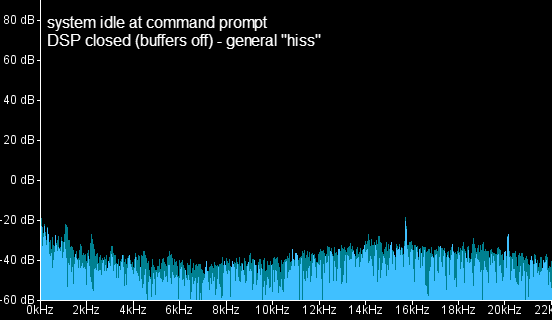 * Noise appears when using headphones (63 ohms) and when connected to the line-in of a PC. 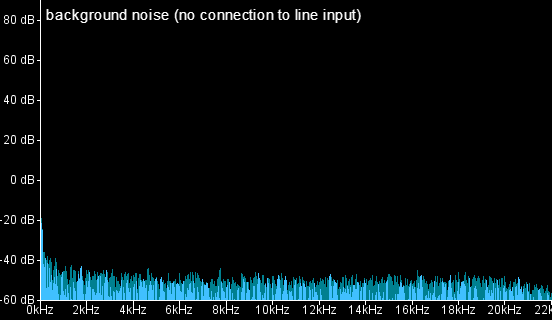 Background noise on my system for comparison (nothing plugged into Line In jack). Nothing out of the ordinary can be heard from the system. Case 2: System running custom application in idle loop. DSP buffer is OFF (/dev/dsp is closed.) The repeated peaks in the frequency domain are characteristic of a sawtooth wave - the application is idling waiting for serial input; when it does not see anything it calls usleep() to delay. 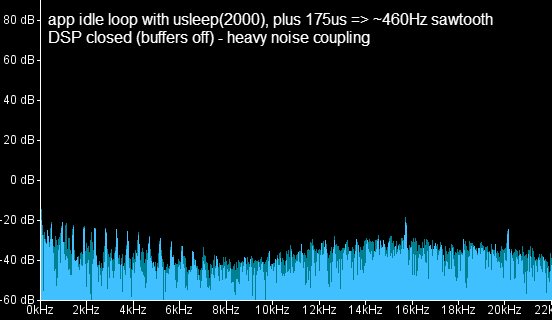 In this case the usleep() period is 2000uS, and by experimentation I have found that the other tasks in the loop take ~175uS, so the overall period is ~2175uS, or 2.175mS, which corresponds to a frequency of ~460Hz - which would definitely explain the noise on the spectrum below. In fact, if I recompile the application to use a different delay for usleep(), the spectral peaks change accordingly. So this is definitely coming from the CPU activity and not some other outside source. Case 3: Same application, playing silent wave data (writing 0x0000 values to /dev/dsp). This holds the DSP open so the output buffers are on. The application is still performing the same loop with usleep(2000), with the additional difference that it is transferring chunks of wave data from the main application logic to /dev/dsp (the audio data could be anything, in this case I forced it to just write silence to get a good comparison graph.) Visually this is pretty similar to the "command line" case above - and it sounds about the same; there's no sawtooth "buzzing" but it's still an undesirable amount of background noise. Has anyone else noticed this? Any suggestions? Did you disable video? Composite video (NTSC) HSYNC approx 15.75KHz, VSYNC approx 60Hz. The video will have high edge rates so the 60Hz will have a number of harmonics. I didn't explicitly enable it (not using it for this project, just the two UARTS). Willing to try it, not sure how to disable it though. I don't know which kernel you are using but I expect the framebuffer and video encoder drivers are built in. You would have to rebuild the kernel without these. If you do not use video I would rebuild to save the memory (& bus cycles) that would be consumed by the framebuffer. There may be another way to disable this via /sys etc, I am not sure. You may even be able to mmap to the lcd interface, disable its clock etc.